FedEx has one of the most intuitive online apps for shipping your eBay merchandise. 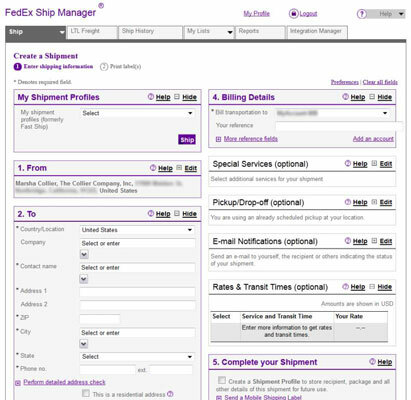 The FedEx Ship Manager interface will turn your computer into a one-person shipping machine. You can search for rate quotes, track packages, and use the shipping notification option to send tracking information e-mails to your recipients. To ship your item from the FedEx website, just Sign In and go to the online Ship Manager by clicking the Ship link. You’ll be presented with a simple, all-in-one online waybill. You can copy and paste addresses from your PayPal account into the online form. Just highlight the text you want to copy and press Ctrl+C. To paste the text, place your cursor in the area you want to fill and press Ctrl+V. Service type: If you’re shipping to a residence via Ground. Select Ground in the service type and be sure to place a check mark in “This is a Residence Address” in Step 2. Dimensions: Be sure that you know the proper dimensions for the package you’re sending. FedEx Ship Alert: Select the e-mail option to send the buyer (and yourself) a notice that the package was shipped and when it is delivered. After you fill out the form, you can click the Courtesy Rate button at the bottom to get a shipping-cost estimate (not including any special discounts). When shipping with FedEx online, if your package is valued over $100 and you use U-PIC for your insurance, put $0 in the Declared Value box. Make note of the package on an insurance log and submit it to U-PIC.